If it's Tuesday, it must be time for another Posh Designs Scrapbook Store Sketch Challenge! This week's is simple and fun. Be sure to stop by and see what the rest of the DT has created with this sketch. 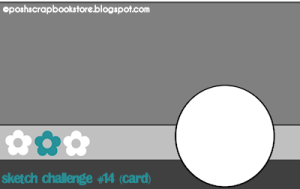 Play along then link up your card on the PDSS blog. I paper pieced her dress and the envelope. Her shoes are patent leather courtesy of Crystal Effects. Beary Sweet May Flowers Challenge.